Generate locations of a random dataset and connect all pairs of points. This demostrates the strategy behind the calculation of variograms, combine all pairs of points. 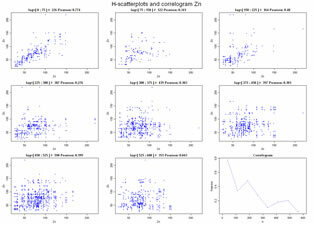 Compute and display H-scatterplots, or self scatterplots of a unique variable measured at several locations. Each plot displays the values of the variable at a specific location and the values of the same variable at another location separared by a distance within and interval. 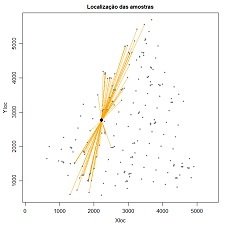 For each plot a Pearson correlation coeficient is computed and at the end Correlation variations along distance (correlogram) is also plotted. Compute experimental variograms for a list of values at 1D. Values are imported from an ASCII datafile. Left graphic display the location and the values. 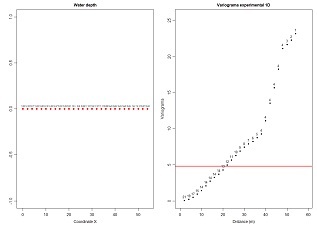 Right graphic represents the experimental variogram and the number of pairs of points of each value. Compute experimental variograms for a list of values at 2D. Values are imported from an ASCII datafile, writted by Y and then by X. First graphic display the location and the values by colours, from blue to red. 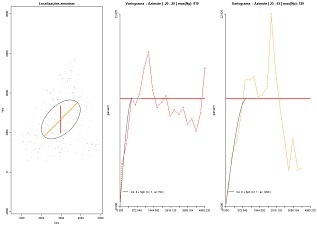 The second graphic represent all the 4 experimental variograms overlaped, and the remaining figures represent the experimental variograms one for each direction. Experimental variograms are computed and showed for four directions, N-S, E-W and diagonals. 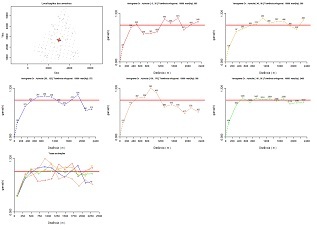 Plot several different theoretical models of variograms in the same plot for sake of comparison. Draw of ellipses showing several theoretical variograms structure ranges. maindir <- ifelse (maindir < 0, maindir+180, maindir) # do not change !!! 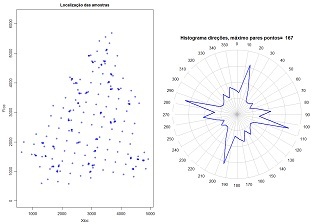 Compute azimuth angles for each pair of points and display a directional histogram. It is usefull for calculation of directional variograms in spatial scattered data. 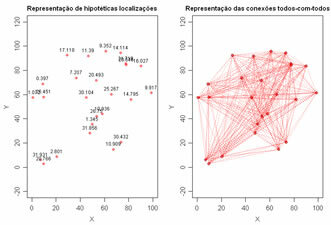 Plot lines conecting pairs of points at specific azimuth angles and tolerances and from a specific sample location. 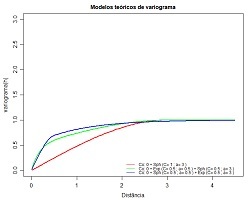 Compute experimental variograms for a 2D scattered data set and save for the fitting step. The first plot show the location of the samples and the directions where the variograms are computed. Then, each plot show the experimental variogram of each direction. The number of pairs of points are displayed for each distance interval. At the end, a plot overlap all the experimental variograms. Each direction has a specific colour. 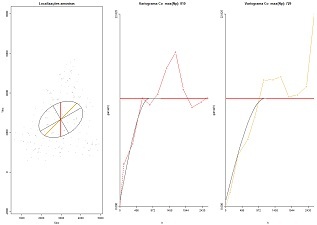 Fit theoretical models of variograms for each direction and represent the global ellipse and the ranges proposed for each direction for coherence purposes. 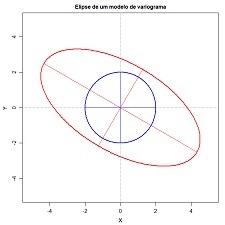 Fit theoretical models of variograms proposing the ranges of an ellipse.